Data released over the past week offers the first glimpse of China’s full-year energy and emissions picture for 2017. After three years of decline, Chinese coal demand recovered modestly – up 3.3% year-on-year. Oil demand grew by 4.6% and natural gas by nearly 16% as Beijing stepped up its air pollution control efforts. Nuclear power generation was up 16%, wind up 26% and solar up 75%. After two years of decline, we estimate that energy-related CO2 emissions grew by between 2.2% and 4.1% last year. We expect rapid growth in natural gas, renewables and nuclear to continue in 2018, and oil demand to expand as well. We do not, however, expect coal demand to keep growing at 2017 levels. Whether emissions continue to rise will depend on whether coal consumption just flattens out or resumes its 2014-2016 rate of decline. As we have noted regularly over the past couple years, the sharp turn-around in Chinese consumption was the primary cause of coal market distress, both in the US and around the world. Between 2000 and 2012, Chinese coal consumption more than doubled, resulting in a more than 50% increase in global coal demand. That pushed up global prices and increased coal exports from the US and other countries. Between 2013 and 2016, however, Chinese coal demand declined, reducing seaborne prices and pushing some of the largest global coal mining companies into bankruptcy protection. The big question has been whether that was a temporary development or whether Chinese coal consumption had finally peaked. New data released over the past week from China’s National Bureau of Statistics (NBS) suggest that following three years of decline, Chinese coal demand grew again in 2017. Using monthly production, trade and inventory data, we estimate a 3.3% year-on-year increase in apparent demand last year (Figure 1). That is a far slower growth rate than the 2002-2012 average and still leaves Chinese coal consumption 8% below its 2013 peak. But it comes during a year in which many analysts expected stepped-up air pollution enforcement to further reduce demand. The enforcement was real and resulted in 16% year-on-year growth in natural gas demand as households and industry were forced to switch away from coal. But that growth in gas demand, along with supply constraints, helped push up gas prices and made coal a little more profitable in power generation. And overall power demand growth accelerated last year. According to statistics out this week from China’s National Energy Administration (NEA), total Chinese power demand rose 6.6% in 2017, up from 2.0% in 2016 (Figure 2). 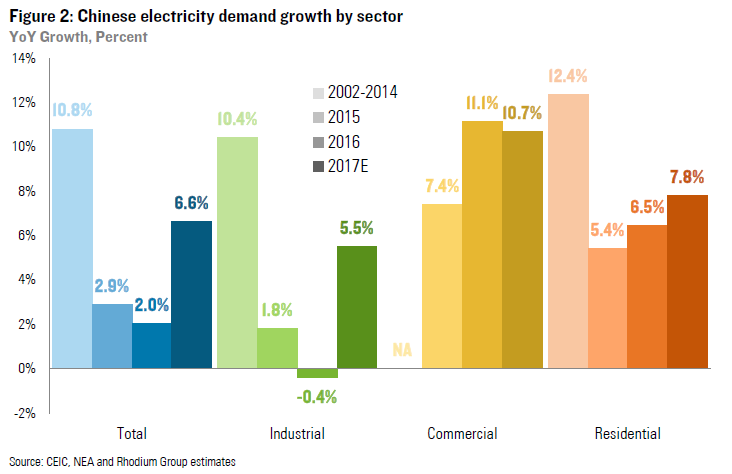 Residential power demand growth accelerated, and commercial sector growth rates remained relatively high. But the big change was a recovery in industrial power generation, which declined in 2016 but was up by 5.5% last year. 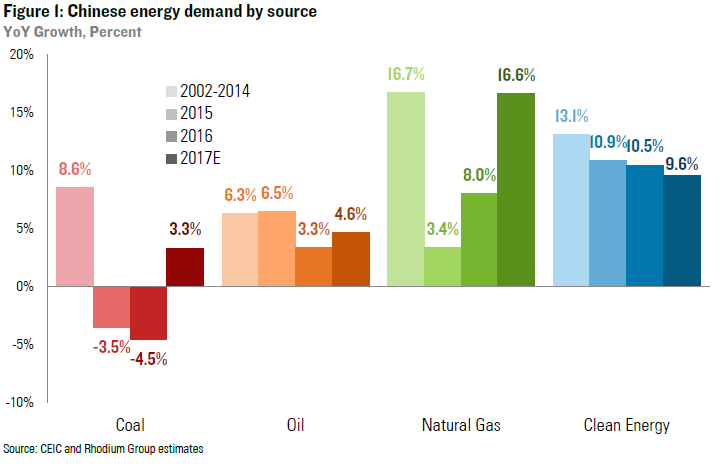 Given industry’s outsized role in the Chinese energy demand equation, that pushed the headline growth figures up to their highest level since 2013. 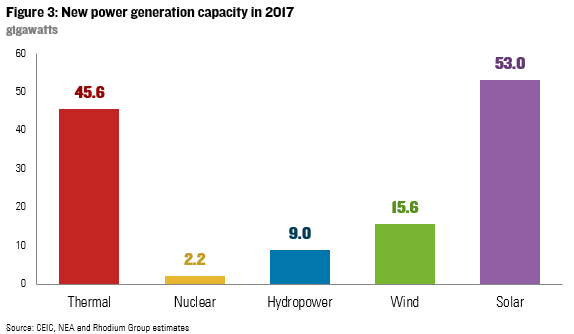 A growing share of Chinese electricity demand continues to be met through nuclear and renewable generation. China added a record 53 GW of new solar capacity in 2017 and solar generation grew by 75% (Figure 3). Wind generation was up by 26% with another 16 GW of capacity connected to the grid. Growth in hydropower and nuclear was more modest. As a result, total clean energy production growth fell slightly from 10.5% in 2016 to 9.6% in 2017. That outpaced fossil fuel power generation, which grew by 5.2%, with the 46 GW of new capacity coming online last year. But the growth rate in fossil generation accelerated in 2017 due to higher overall power demand, and the pace of efficiency improvements in the coal-fired power fleet declined. The combined effect was a significant increase in the amount of coal consumed in the electric power sector. Part of the recovery in industrial power demand came from a modest price-driven increase in crude steel production. 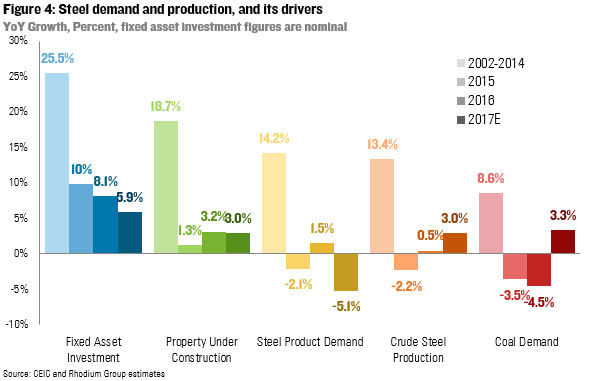 Fixed asset investment and property construction both continued to decline last year, and apparent demand for steel products declined as well. But higher steel prices likely resulted in some crude steel restocking, which boosted both coal-fired electricity consumption and metallurgical coal demand (Figure 4). Oil demand grew by 4.6% in 2017, compared to 3.3% in 2016 (but still well below 2002-2014 average annual levels). Auto sales, passenger miles traveled, and gasoline demand continue to hum along at a pretty healthy clip. 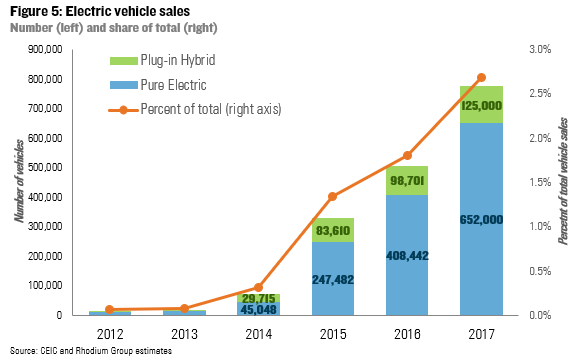 China continued to lead the world in electric vehicle sales with nearly 800,000 new plug-in and fully electric vehicles hitting the road last year (Figure 5). That’s four times the amount sold in the US. But at 2.6% of total passenger vehicle sales, it is not yet enough to make a meaningful dent in Chinese oil consumption. Jet fuel demand growth was up significantly on the back of strong domestic air traffic, as was LPG and ethane demand. Diesel posted weaker gains, but demand actually grew in 2017 compared to a year-on-year decline in 2016. That accounts for most of the headline oil demand growth acceleration in 2017. The decline in Chinese coal consumption resulted in a drop in overall carbon dioxide (CO2) emissions from energy consumption in 2015 and 2016 after more than a decade of rapid growth. 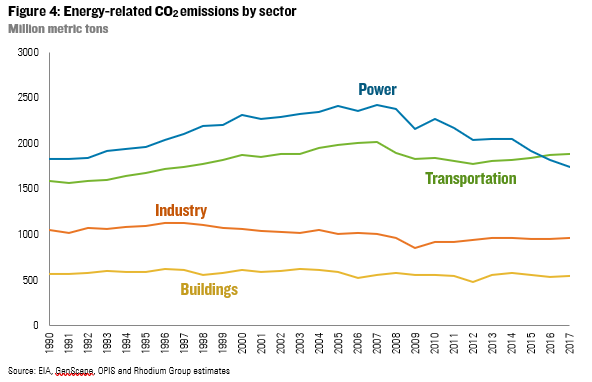 Given China’s status as the world’s largest emitter, the decline in Chinese emissions resulted in a flattening in global CO2 emissions during those years. 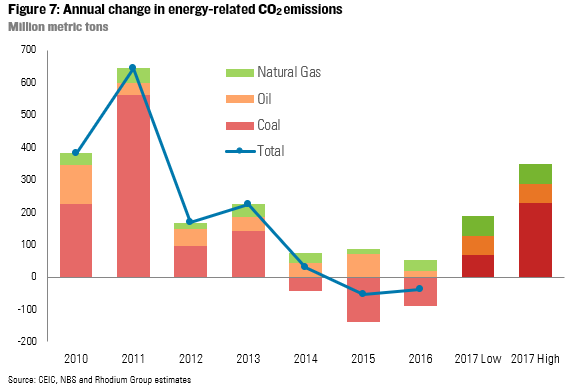 A rebound in Chinese coal demand in 2017 means growth in CO2 emissions as well. How much emissions increased depends on the average thermal content of coal consumed last year. The Chinese government’s method for calculating this has never been terribly transparent, and bounces around a lot year to year. That doesn’t necessarily suggest data manipulation – thermal content varies considerably across coal types – but it means it’s hard to predict where the official government estimates will end up. If average coal quality remained the same in 2017 as in 2016, Chinese energy-related CO2emissions increased by nearly 4.1% – the fastest annual growth rate since 2011. Last Friday, China’s NBS released a communique preliminarily estimating that total primary energy demand grew by 2.9% in 2017 and that coal’s share of total energy supply declined by 1.7%. If correct, that would suggest a significant reduction in the average thermal content of Chinese coal consumed in 2017 relative to 2016 levels. Because thermal content, not raw weight, drives CO2 emissions that would suggest 2017 Chinese CO2 emissions increased only 1.3 to 1.5%. We have difficulty reconciling this with the strong growth in thermal power generation and the uptick in crude steel production last year. 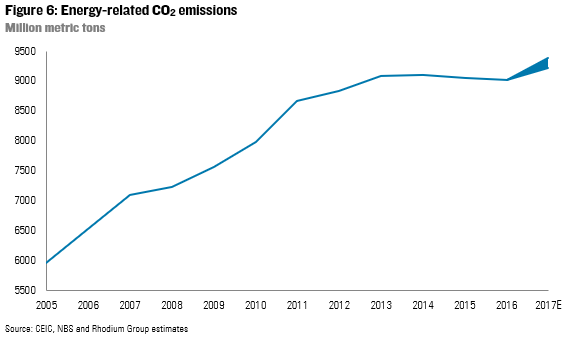 We believe 2.2% is a reasonable lower bound estimate on Chinese emissions growth last year. A One-Off or The New Normal? Does last year’s recovery in coal demand and CO2 suggest China is returning to the rapid growth rates seen between 2002 and 2012? We don’t think so. The 2017 slowdown in credit growth, fixed asset and property investment, and resulting steel and cement demand is set to continue in 2018. But last year’s mini-rally in industrial production is not. Our China financial markets and macro research teams recently assessed the outlook for growth and credit policies in 2018. They expect deleveraging efforts to increasingly target SOEs, likely raising financing costs for the corporate sector and thus suppressing industrial activity. Their baseline expectation is that real gross capital formation grows by somewhere in the neighborhood of 5% in 2018, just slightly up from 4.7% in 2017, but mostly due to low base effects. This is well below historical growth rates and is slower than expected headline GDP growth – meaning by definition that investment’s share of growth will shrink in 2018. Chinese utilities are bringing online coal-fired power plants approved several years ago, but few new plants are getting the green light. Indeed thermal power investment declined by 34% last year. Nuclear, natural gas and renewable expansion, on the other hand, is set to continue, which will further cut into coal’s market share. China now needs to deliver significant and sustained coal consumption reductions for its emissions to decline. Coal consumption must fall fast enough to offset continued growth in natural gas and oil demand. That occurred in 2015 and 2016 (Figure 7), but future shifts will require a greater level of environmental and structural adjustment policy commitment than we are currently seeing out of Beijing. A more likely scenario is that Chinese emissions remain at roughly current levels for the next 5 to 10 years as modest declines in coal demand are offset by growth in gas and oil – until electric vehicle penetration reaches a level where oil demand begins to decline.